The Heritage Band of the Midwest (HBM), also know as the “Bunny Band,” is an all-volunteer ensemble of musicians that gather once a year during Easter week for three days to record an album of lesser-known wind band music with a traditional 19th century instrumentation. The story surrounding the ensemble is told through a cast of four: a wealthy philanthropist and euphonium musician who dedicated much of his life to preserving wind band music, a professor who focused his career on researching and arranging lesser-known wind music of Europe, the band itself, and the generations of musicians who volunteered their time and talents. The storyline has repeated itself each year since 1974 as the musicians gather for the annual recording event. The catalyst for this initiative was the “Heritage of the March” recordings initiated by Robert “Bob” Hoe Jr. in the 1970s. This article documents the 41-year history of the Heritage Band of the Midwest, presents the findings of a survey of current and past musicians of the ensemble, and introduces The College Music Society’s (CMS) archive of 44 HBM albums (1974 to 2015) as part of the CMS Symposium’s online Audio Performance Archive. The ensemble has recorded under various names including Heritage of the March, Foeller’s Illinois State Alums & Friends (FISAF) Band, the Heritage Band of the Midwest (HBM), and more affectionately, the “Easter Bunnies” or the “Bunny Band.” The acronym HBM will refer to the ensemble in its various renderings throughout this article. The story of the Heritage Band of the Midwest will be told through a cast of four: the philanthropist, the professor, the band, and the musicians. The wealthy philanthropist and euphonium player who dedicated much of his life to performing and preserving wind band music; the professor who dedicated his career to researching and arranging little-known wind music of Europe, especially Austro-Hungarian band music; the HBM band itself; and the generations of volunteer wind musicians who donated their time and talent. The final section will describe the contents of the newly established CMS Audio Archive of this treasure trove of Heritage Band of the Midwest recordings. Figure 2a. 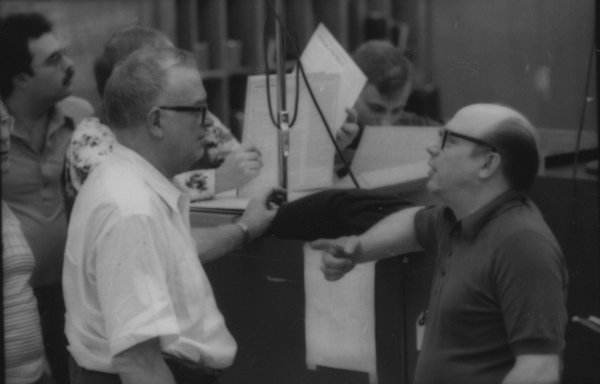 Robert “Bob” Hoe with Professor George Foeller during a rehearsal with the Heritage Band of the Midwest (also known as the FISAF or “Bunny Band”) at the Fairbury (Ilinois) High School in 1978. Behind Bob Hoe is Mark DalPazzo who still plays with the band (Photo from the library of George Foeller). As the online Heritage Encyclopedia of Band Music (HEBM) notes, Bob Hoe sought to “document and preserve lesser-known band works and to present biographical information on composers about whom the public knew little or nothing.”11 Many of the recordings featured two composers, one American on side A and a European composer on the flip side of the LP. Intermixed were various themed recordings and Sousa collections. Included with the recordings along with marches were gallops, waltzes, overtures, and various transcriptions. Figure 2b. 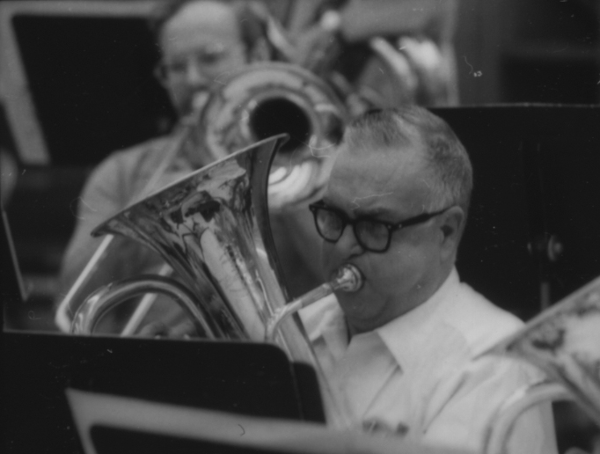 Bob Hoe playing euphonium with the HBM ensemble in Fairbury, Illinois, in 1978 (Photo from the library of George Foeller). Figure 2c. The album cover from Volume 87 of the Robert “Bob” Hoe “Heritage of the March” series with the Heritage Band of the Midwest . The album was dedicated to Robert “Bob” Hoe, shown in the center of the album, and produced after his death. The recordings continued up until his death in 1983 with some 3000 works for band. After Hoe’s death, his family and music colleagues continued mastering the remaining tape recordings to LPs and promoting his work through the Robert Hoe Foundation based in his hometown of Poughkeepsie, NY. The three volume, Heritage Encyclopedia of Band Music13 (HEBM), published posthumously by the Hoe Foundation, indicates that the Hoe Heritage series consisted of 263 LP recordings. Typically, some 2000 copies of an LP album were pressed and all of the recordings were distributed without cost to those who requested them. The HEBM is now an online, searchable resource for band music and composer biographies. A complete list is available on the online HEBM website under the heading, “The Hoe Heritage Series of LP Recordings.”14 The HEBM site also includes Robert Hoe recordings among its encyclopedia of band music. The University of Maryland also has digital archives of Hoe’s recordings and newsletters.15 Bradley’s On and Off the Bandstand16 offers more detail on Hoe’s project including information regarding bands like Foeller’s and the role these bands played in contributing to Hoe’s voluminous “Heritage of the March” collection of wind band music. George Foeller is Emeritus Professor of Music at Illinois State University. 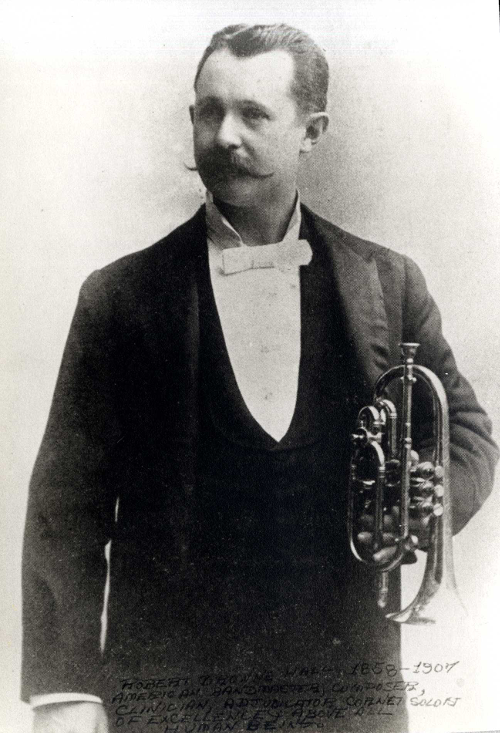 Prior to coming to ISU, Professor Foeller directed bands and taught instrumental music in the public schools in the states of Connecticut and Texas.17 Early in his career he was motivated, much like Bob Hoe, to find little known wind band music to expand the repertoire of his student ensembles. He was especially interested in the band music and the style of European composers and bands. Figure 3a. 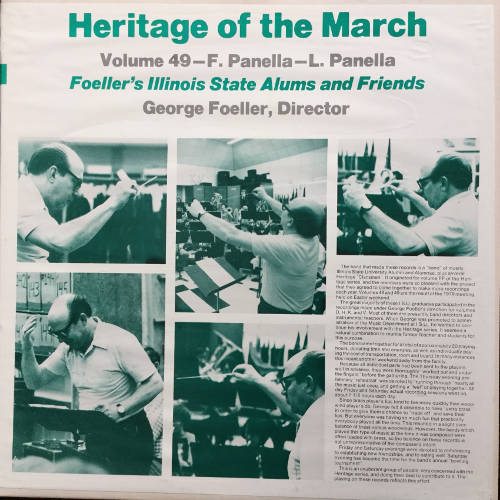 The album cover from Volume 49 of the “Heritage of the March” series the Heritage Band of the Midwest (also know as the FISAF or “Bunny Band”) under the direction of Professor George Foeller. Foeller recorded 12 LP albums as part of Hoe’s Heritage of the March series. Those recordings are included in the CMS Symposium Audio Archives from 1974 to 1983. 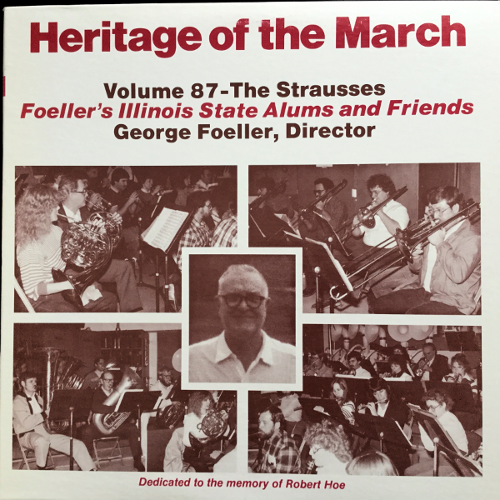 From 1974 to 1977 the recordings featured the Illinois State University band with Foeller as director. Following a path of Foeller’s students, many now high school band directors, the HBM ensemble moved its annual sessions in 1978 to Fairbury High School (Illinois). In 1985 the recording sessions moved to Chillicothe High School (Illinois). And, in 2000, the recording sessions were moved to Iowa and the Maquoketa High School where it continues to hold its annual recording sessions. The recordings which started as LP records, migrated to cassette recordings, and then to CD discs.23 Two albums of selections from past HBM recordings were created in 2009 for iTunes and Amazon digital distribution, but were withdrawn in 2014 because of the distribution fees. Figure 3c. 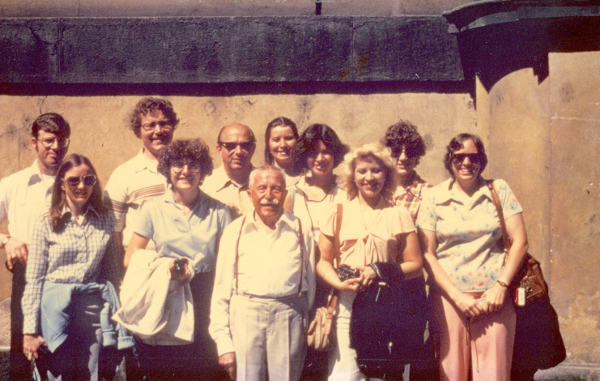 Another photo from the student travels in 1979. This is taken in Prague, behind the Iron Curtain at this time. 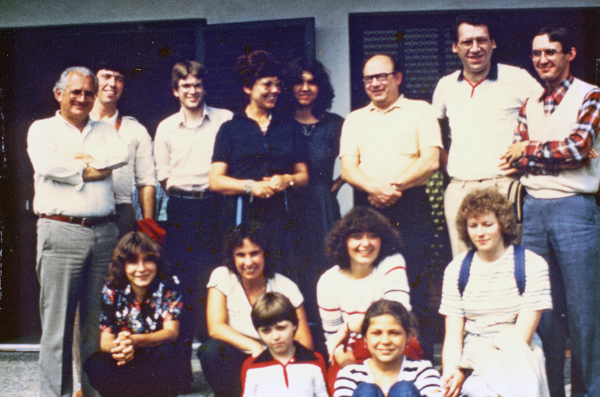 Shown are Foeller (3rd from the left on back row) and Dr. Miroslav Blaha on the front row. Dr. Blaha helped Foeller with researching many Czech composers and translations. Two notable students on the back row from the left are Jay Kahn who continues to play in the band and Dan Deitrich who played for many years (Photo from the library of George Foeller). According to Foeller, “Bob [Hoe] played on all the recordings starting with the first Fairbury session, but he did not play on the very last one.”24 When old-timers of Foeller’s band gather they have many stories to share of the eccentricities of Bob Hoe. 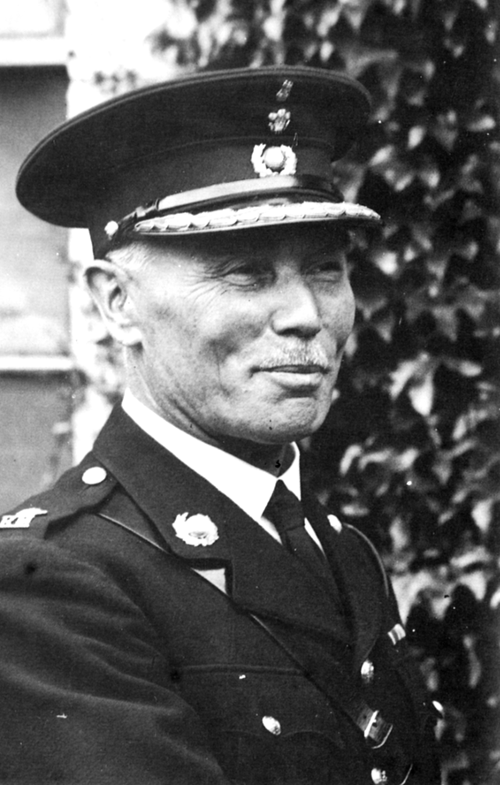 He had his own notions as to how band music, especially the marches, were to be played and he didn’t hesitate to share his opinions and interpretations. The last two of the Heritage of the March LPs (Volumes 87 and 88 in the Hoe series) produced with the HBM band, known at this time as the FISAF band, were made after Hoe’s death in 1983 with Volume 87 dedicated to the memory of Robert “Bob" Hoe, Jr. The HBM, under its several appellations from the Illinois State University Band, to “Foeller’s Illinois State Alums and Friends” or FISAF, to the “Bunny Band,” consists of some 40 volunteer musicians under the direction of Professor Foeller. The instrumentation of the Heritage Band of the Midwest closely resembles that of a town or military band of the late 1800s to create a sound fairly typical for that time.25 Clarinets and flutes augment the basic brass sound; double reeds and saxophones are absent; percussion is minimal. For most of the recordings the instrumentation includes flutes & piccolo, B♭ and E♭ clarinets, horns, flugelhorns, trumpets, trombones, euphoniums, tubas, and percussion. As one might expect from an all volunteer ensemble, achieving a balanced instrumentation for the once-a-year recording session has always been a challenge. This is especially so with the woodwinds. A perusal of the album jackets from the HBM archives shows that clarinets and flutes were abundant in the earlier years and gradually thinned in the more recent recordings. At various times, additional instrumentation has been added as the music demanded. The earlier recordings up until about 1996 often used additional woodwinds, e.g., oboe, bass clarinet, or bassoon. Figure 4a. 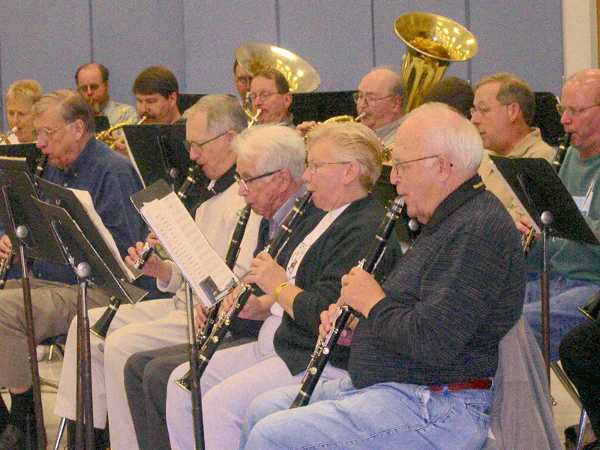 The Heritage Band of the Midwest (The “Bunny Band”) in its 2004 recording session. Clarinets are left to right: Charles DCamp, Bob Kremenak, Dr. Himie Voxman, Judy Mathieson, and Jim Mougey (Photo used with permission from the Maquoketa Sentinel-Press). Figure 4b. 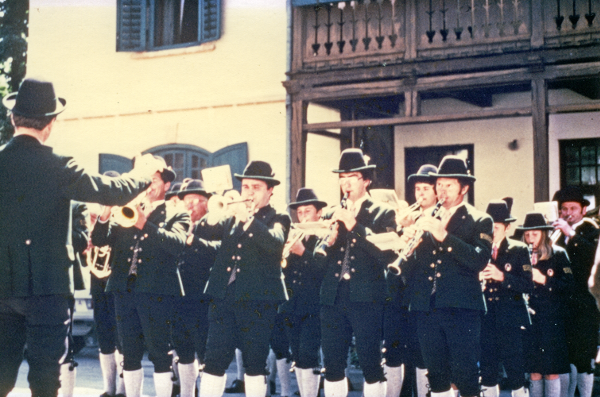 The Pürgg, Austria, town band with director Dr. Wolfgang Suppan and instrumentation typical of town bands and the HBM ensemble (Photo from the library of George Foeller and taken on his student tour of 1979). Survey items included information about the musicians’ music background: instruments played, their musical training, music and work experience, and the variety of ensembles they have participated in. Other survey items focused specifically on the HBM experience: number of years they have played in the band, travel distance to recording sessions, number of years participating in the ensemble, and the era in which they had participated. Items on the survey also asked the musicians to reflect on their experiences with the band. The survey was sent to 108 musicians for whom email addresses were available. Thirty-eight (38) musicians responded to the survey. Music background. Based on the survey data, a typical musician in the HBM can be characterized as follows: he or she has more than 25 years of performance experience in a variety of ensembles; an undergraduate or graduate training in music; a professional career in music in some role—most likely a music educator; and was willing to drive 160 miles or more to the annual recording sessions. Specifically, the data show that 24 of the musicians had 25 years or more of playing experience; the remainder: 16-24 years (2), 10-16 years (7), 5-9 years (4), 1-4 years (4). The extent of music training included: 6 with secondary school and private study;, 15 with undergraduate music training;, 10 with graduate music training;, and 7 with training beyond graduate school. When asked if they worked in some professional music capacity, 50% said yes, 26% indicated yes, but had retired, and 24% indicated no. Those that did not work in music were from diverse backgrounds: a veterinarian, a banker, a teacher, a machine operator, an engineer, a farmer, an electrician, an information technologist, a county government administrator, and a railroad machinist-electrician. Those 76% working in music professions currently or retired included secondary-middle school music directors (11), elementary music teachers (4), college music professors (4), studio musicians/private music teachers (6), music business professionals (3), and an organist (1). The respondents were asked “what other ensembles do you play in?” Thirty one (31) indicated community bands. Twelve (12) perform in various wind ensembles and ten (10) in symphony orchestras. Others noted: jazz, big, and swing bands (14), military bands (3), various wind ensembles (4) and brass ensembles (12), German-polka bands (3), and choral/church groups (7). The distribution of respondents provided a balanced representation of participation over the 40-plus-year span of the ensemble. Twenty-one (58%) of the respondents were currently active in the HBM. When asked how many non-consecutive years they had played in the HBM the results were as follows: 13.2 years on average, the median or midpoint was 8.5 years, and the range was 1 to 40 years. What was the farthest they had driven for an annual HBM recording session? The average was 176 miles, the midpoint was 160 miles, and the range was 3 to 860 miles. All instruments within the ensemble were represented with some musicians having played multiple instruments: Flute/Piccolo (9), Clarinet (9), Bassoon (1), Trumpet (2), Flugelhorn (3), Horn (4), Euphonium (4), Trombone (6), Tuba (1), and Percussion (4). Figure 5. 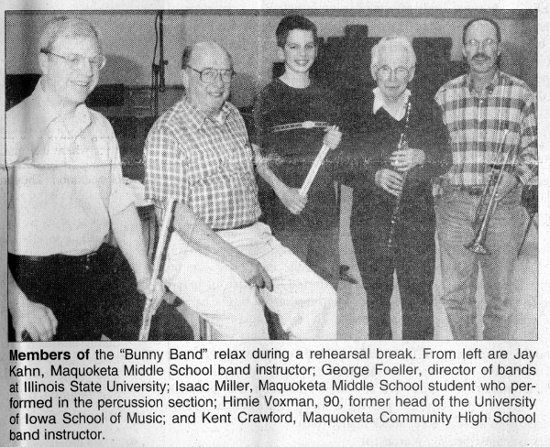 From a Maquoketa Sentinel-Press article, August 1st 2001, showing Himie Voxman with the Director, George Foeller, and the local Maquoketa players. Notable is the diverse age of the band members (Photo used with permission from the Maquoketa Sentinel-Press). Two questions addressed the perceived music ability of the musicians in the ensemble and the difficulty of the music. On a scale of 1 (definitely amateur) to 5 (definitely professional ability) the responses were skewed toward a professional ability: 0% (1), 2.8% (2), 13.9% (3), 52.85 (4), 30.6% (5). To the question, “how would you rate the difficulty of the music,” the responses where skewed toward moderately (3) to very challenging (5) music repertoire: 0% (1, not challenging at all), 8.33% (2), 30.6% (3), 38.9% (4), 22.2% (5). 2. Preserve and appreciate history (11): The importance of preservation was emphasized through comments such as the importance of “participation in an ongoing project that has validity,” and the need “to have a professional level archive of music that would otherwise be lost. 2. For the enjoyment and camaraderie (16): A shared sense of the enjoyment is captured in these reflections: “one of the most rewarding things I do all year,” enjoying “the comradeship both musically and socially,” and the “pure pleasure to perform with other professionals from around the country and learn new repertoire.” As one musician shared, “I have developed friends in the band that I really enjoy seeing each year; if I pay attention, I usually learn something.” And for a nice coda, “It is just plain fun”! The third question in this set asked “What was the biggest challenge you found playing in the Bunny Band?” Here the responses were quite varied with more detail than one could reasonably share in this article here. The more frequent contributions fit under (1) recording and performance challenges and (2) mental and physical challenges. 3. Other challenges (10): Other responses touched on the style of music and the time and schedule. “At the beginning, finding the right style that is required to perform this music: "ALL must play the style for these recordings to fly!”, “Finding time in a busy schedule to practice the music”, and “leaving my family for the weekend” were challenges shared by many of the musicians. The fifth question requested they “Share one memorable experience playing with the Bunny Band.” As one might anticipate, the responses were highly varied and touched on tradition, musicianship, camaraderie, and the band’s personal humor that evolved over its forty plus years. Figure 6. 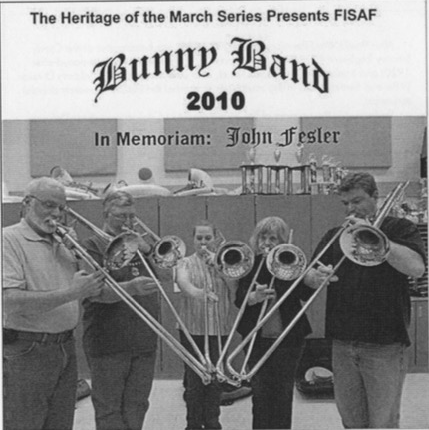 The 2010 cover of the HBM (or the FISAF or Bunny Band) featuring the trombone section and dedicated in memory of the tuba player, John Fesler, who played with the band for many years. "The glue that keeps us all together is easy for us all to recognize and this is George Foeller. He is the one who pulls that style out of all of us and gives us that special sense of pride and accomplishment." The comments offered from the survey provide a welcomed human touch to the experiences, sense of community, and spirit of the musicians. Their responses offer a personal history of the ensemble, and an appropriate backdrop to the 40-plus years of music making represented in the CMS Symposium’s Audio Archives of 44 albums of HBM performances. The history of the HBM ensemble and the testaments given by the musicians reinforces the compelling need to find a home for the some forty-plus years of time and talent given by Hoe, Foeller, and the musicians to maintain and expand this unique, international contribution to wind band music and its composers. For the first time, these recordings are archived, catalogued and made accessible for future listening and research through the CMS Symposium. And, in keeping with Robert Hoe’s wish, the archives through the support of The College Music Society, are free and accessible internationally to the online community. The CMS Symposium Archive is the first completely digitized set of the HBM recordings. Like many of the Hoe recordings, the HBM recorded other music genres beyond the march, namely waltzes, overtures, Spanish paso dobles, and orchestral transcriptions. Along with the recordings are scans of the album covers with program notes. The album notes alone provide a rich resource of historical information on the music and the composers. The international mix of band composers is extensive with a preponderance of European composers. A few examples include the following: American (Frank and Louis Pinella, David Wallace Reeves, W. Paris Chambers, Robert Browne Hall, Frank H. Losey, and Charles L. Barnhouse), Armenian (Aram Khachaturian), Austrian (Johann Fuchs, Karl Komzák, and the Strausses), Bohemian (Franz Kaschte), British (Kenneth J. Alford), Czech (Julius Fučík, Anton Rosenkranz), French (Louis-Luc Fersuis and Gabriel Pares), German (Hermann Blankenburg, Paul Lincke, and Georg Fürst), Italian (Salvatore Pucci, Tommaso Mario, and Mariano Bartolucci), Lithuanian (Bronius Jonusas), Moravian (Franz Lehár Jr. and Sr.), Norwegian (Rolf Lindstad, Willy Schikora), Romanian (losif Ivanovici), Russian (Semyon Tchernetsky, Vasily Soloviev-Sedoi), Slovakian (Rudolf Obruca), Spanish (Jaime Texidor, Luis Araque, Santiago Lope), Swiss (Gian Battista Mantegazzi), Uruguayian (Cayetano Silva). From the master list of recordings, there are some 79 unique Austro-Hungarian composers within the HBM collection. The HBM recordings are organized by year from 1974 to 2015. In some of the early Bob Hoe series recordings, two albums were produced in a year. The outline below indicates by year the album media type and the location of the recording sessions. The outline also indicates which albums were part of the original Hoe “Heritage of the March” recordings and the HBM albums that followed in the spirit of the Hoe heritage project. There are 44 albums in total in the archives. - Hoe’s Numbered Series: albums 48 & 49 (1979), 56 (1980), 71 (1981), 77 & 78 (1982), 87 & 88 (1983). ⁃ 2 cassette recordings (1984 and 1985): FISAF Band on its own; no longer officially a part of the Hoe recording series. Complete Heritage Band of the Midwest audio archives (Large file to load; best option to search for titles or composers across all albums). Note: All of the recordings in the HBM audio archives are performed from arrangements by George Foeller, the Director, or friends of the Director. The arrangements are unpublished. To the best of Professor Foeller’s knowledge the music is free of copyright given the age of the composers. In the spirit of the Heritage Band of the Midwest dating back to Robert “Bob” Hoe, all recordings are distributed free. Should a composer or publisher identify a work that is under copyright and not available for public dissemination, please notify us and the audio recording will be removed from the archives. The complexity of compiling the 40-plus year history and recordings for the Heritage Band of the Midwest cannot be overstated. It has been a team effort and a labor of love. Recognition goes to HBM players Fred Lange (trombone with HSM since 1974) and Dan Weil (euphonium since 2010) for their help in assisting with digitizing LPs, cassettes, and CD discs for the HBM Albums. Dr. James Parr (tuba since 1987) came to our rescue in helping to edit the master list of albums, music titles, and composers; given the extensive foreign origins of much of the music, dealing with issues like the diacritical markings was a tedious but important task. He was assisted by Jane Wilson, a Czech language consultant. Thanks also to the current and past members of the Bunny Band that took time to respond to the survey and share their experiences. And, finally, thanks to Professor George Foeller for always being available to answer questions, share various moments in the band’s history, and dig into his archive of materials to retrieve key information. On behalf of all the musicians who have volunteered their time and talents to the HBM ensemble, a profound expression of appreciation to George Foeller for his musicianship, research, leadership, and dedication in making this unique project possible. 1George Foeller, "Conversations and Correspondence,” unpublished interviews by the author, 2014 – 2016. Throughout the research and writing of this article, the author was in close contact with Professor Foeller to ensure the accuracy of the history of the Heritage Band of the Midwest. 6Arthur Bradley, "Heritage of the March,” 169. 7Jay Kahn, “The Last ‘Heritage of the March’ Band,” 71. 9Arthur Bradley, “Heritage of the March” 171. 12Arthur Bradley, “Heritage of the March,” 181. 13William H. Rehig, et al., The Heritage Encyclopedia of Band Music. 14The Hoe Heritage Series of LP Records. 18Jay Kahn, “The Last ‘Heritage of the March’ Band,” 71. 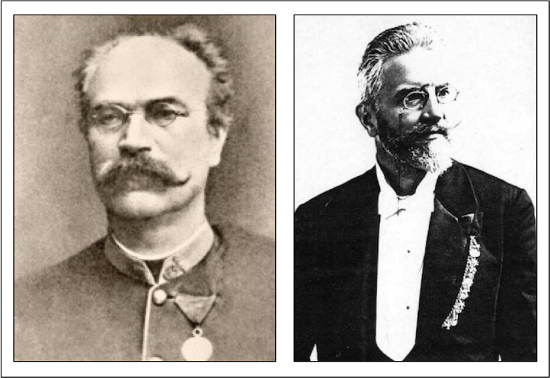 19George Foeller and Werner Probst, Bands of the Austro-Hungarian Empire. 20Arthur Bradley, “Heritage of the March,” 177. 23George Foeller, “Conversations and Correspondence.” Ibid. 26The author and his wife, Kay Williams, began playing clarinet with the HBM in 2008. Bradley, Arthur. “Heritage of the March.” In On and Off the Bandstand, 169-90. New York: IUniverse, 2005. Foeller, George. “Conversations and Correspondence.” Personal interviews by David Brian Williams. Bloomington, IL, 2014-2016: Unpublished. Foeller, George, and Werner Probst. Bands of the Austro-Hungarian Empire: A Reference Work for the Concerned American Band Musician. Normal: Printed by G. Foeller, 1987. "George Foeller. Phi Beta Mu Website Biography". Last modified, 1997. Accessed September 23, 2016. http://phibetamuxi.org/Phi_Beta_Mu/Foeller.html. Grimshaw, Jeremy. “Eastman Wind Ensemble: Artist Biography.” AllMusic. Accessed September 21, 2016. http://www.allmusic.com/artist/eastman-wind-ensemble-mn0000587245/biography. "Heritage of the March.” Wikipedia. Accessed September 9, 2016. https://en.wikipedia.org/wiki/Heritage_of_the_March. Kahn, Jay. “The Last ‘Heritage of the March’ Band: The Bunny Band Continues to Hop Merrily Along.” Band International 33, no. 2 (2011): 71-72. Kahn, Jay. “Maquoketa Hosts ‘Heritage of the March’ Project,” Maquoketa Sentinel-Press, August 1, 2001. "Milestones in Wind Ensemble History.” Eastman Wind Ensemble. Accessed September 21, 2016. http://www.esm.rochester.edu/ewe/milestones.php. Rehrig, William H., Paul E. Bierley, and Robert Hoe. The Heritage Encyclopedia of Band Music: Composers and Their Music. Vol. 1-3. Westerville, OH: Integrity, 1991. Print. "Robert Hoe Collection.” ArchivesUM: University of Maryland Libraries Digital Collections. Accessed September 21, 2016. http://hdl.handle.net/1903.1/19199. "Robert Hoe, Jr., Benefactor.” Heritage Encyclopedia of Band Music. Accessed September 9, 2016. http://hebm.info/AboutUs/Contributors.aspx. "The Hoe Heritage Series of LP Records.” Heritage Encyclopedia of Band Music. Accessed September 21, 2016. http://hebm.info/AboutUs/TheHoeSeriesOfRecordings.aspx. "The Legacy of Robert Hoe, Jr.” Heritage Encyclopedia of Band Music. Accessed September 9, 2016. http://hebm.info/AboutUs/TheLegacyOfRobertHoe.aspx. David Brian Williams is a consultant in music technology and higher education, and Emeritus Professor of Music and Arts Technology at Illinois State University. His degrees are in music education and music theory and composition (BMEd and MM) from Northwestern State University of Louisiana, and a PhD in Systematic Musicology from the University of Washington. He has served in faculty, research, and administrative positions at the University of Guam, University of Washington, Southwest Regional Laboratory for Education Research and Development, California State University at Los Angeles, Illinois State University, and Boston University. Dr. Williams interests are in music education and research, music psychology, and music and arts technology. The 4th edition of his textbook, Experiencing Music Technology, co-authored with Peter Webster is in preparation for Oxford University Press. He has served on the boards of NAfME, CMS, IMEA and CMEA, ATMI, and TI:ME, and has published in various music research and education journals. He is a past president of The College Music Society. David is also a composer, co-creating the multimedia performance work with Tayloe Harding, Grassroots 2008 and 2012, with several performances nationally, and his sacred choral work, Make Haste O God, was recently performed by the Illinois State University Men's Glee Choir. With his wife, Kay, they stay active in the Bloomington, Illinois community as woodwind players.